I.G.F.A. 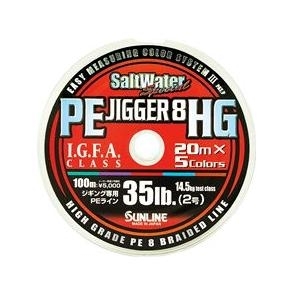 Class Saltwater High Grade 8 strand PE jigging line. With exceptional strength for its diameter and smooth surface manufacturing method which reduces guide friction enabling the jig to fall as fast as possible. The unique colour marking system changes every 20m with white markings in the first 10m of each colour and yellow markings in the next 10m of every colour.